CHICAGO, June 13, 2018 /3BL Media/ — As part of Mohawk Group’s ongoing commitment to leave more handprints than footprints, the leader in commercial flooring joined Groundswell, Elevate Energy and other partners in south Chicago today for the unveiling of a new smartflower™ solar system. 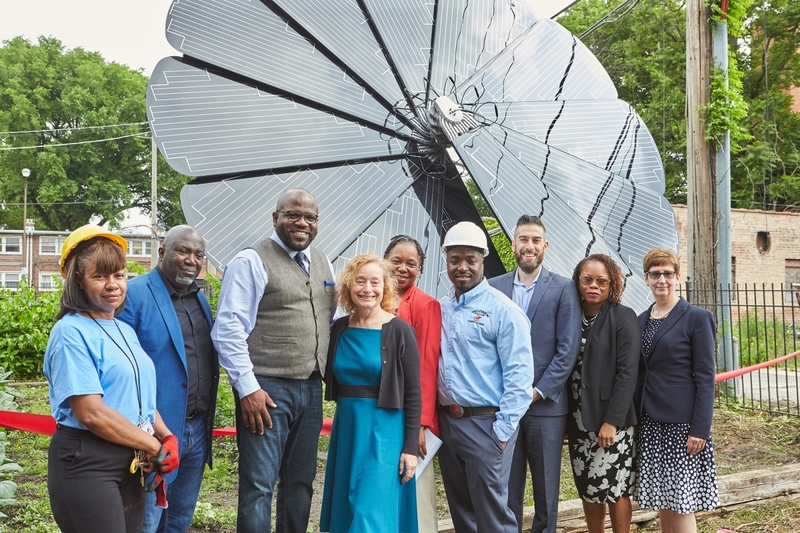 The smartflower, located at The Renaissance Collaborative (TRC) in the Bronzeville community, officially launches an innovative solar energy partnership that includes the installation of 10 units across the U.S. over the course of three years. Each system will be established in underserved communities near educational institutions with STEM programs. Mohawk Group is sponsoring the solar energy initiative as a “handprinting” strategy for the Living Product Challenge Petal Certification of its newest carbon-neutral products designed to leave a smaller environmental footprint. The biophilia-inspired Sunweave (woven broadloom and area rug), Nutopia and Nutopia Matrix (carpet plank) and Pivot Point Red List-free ERT (enhanced resilient tile) debuted this week to the architecture and design community at NeoCon in Chicago. The Living Product Challenge provides a framework for manufacturers to reimagine the design and construction of products to function as elegantly and efficiently as anything found in the natural world. All Living Products are created to be net positive and benefit people and the environment. Learn more about Mohawk Group’s commitment to handprints over footprints in the NeoCon virtual tour.